Rosacea or "middle-age acne" is very common and causes redness and swelling on the face. 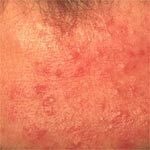 Rosacea may begin as a tendency to blush easily and gradually progress to persistent redness and acne-like bumps involving the cheeks, forehead, chin, and nose. In more severe cases other symptoms include broken capillaries on the surface of the skin, enlarged red nose and puffy cheeks. No one really knows what causes rosacea. There are aggravating circumstances that can worsen the condition, such as psychological stress, sunlight exposure and certain foods including spicy foods, alcohol, coffee and caffeinated beverages. Women get rosacea more often than men, which has been associated with menopause. A combination of treatments may be recommended depending on the severity of the skin condition. Commonly, rosacea is treated with Topical Antibiotic creams such as Metronidazole. Oral Antibiotics may also be prescribed and usually work faster. Limit exposure to sunlight and always use sunscreens. Newer therapies include the use of lasers and intense pulse light sources (i.e. PROLITE for Photorejuvenation) to treat the blood vessels.